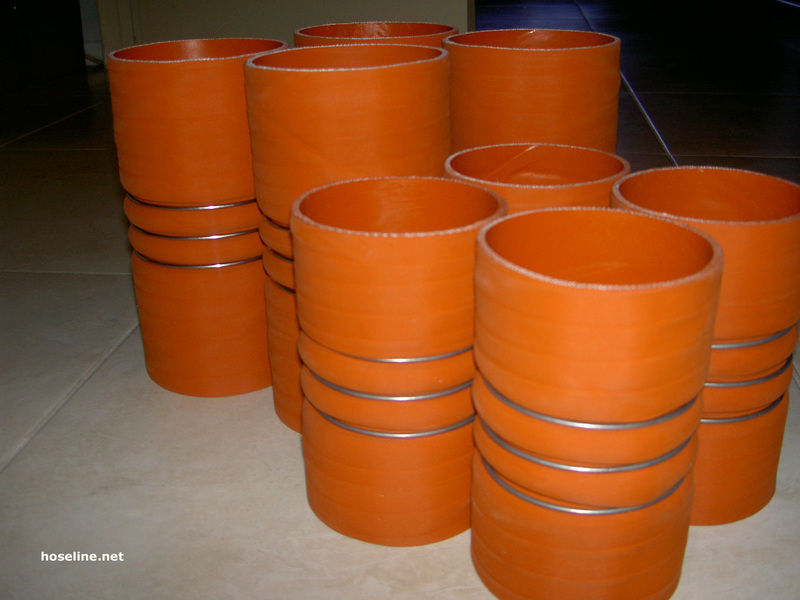 Silicone rubber hose construction. Manufacturer's data: 71 Durometer (Shore A points; ASTM D 2240); tensile strength: 1,025 psi (ASTM D 412); elongation: 271% (ASTM D412); compression set: 18.2% (70 hours at 347 °F. ASTM D 395). Color: flame red. Photo you see here is too dull, and does not represent the true bright "flame red" color. These hoses are very flexible, will not crack or deteriorate easily when exposed to weather and high temperatures, compared to SBR and other rubbers. 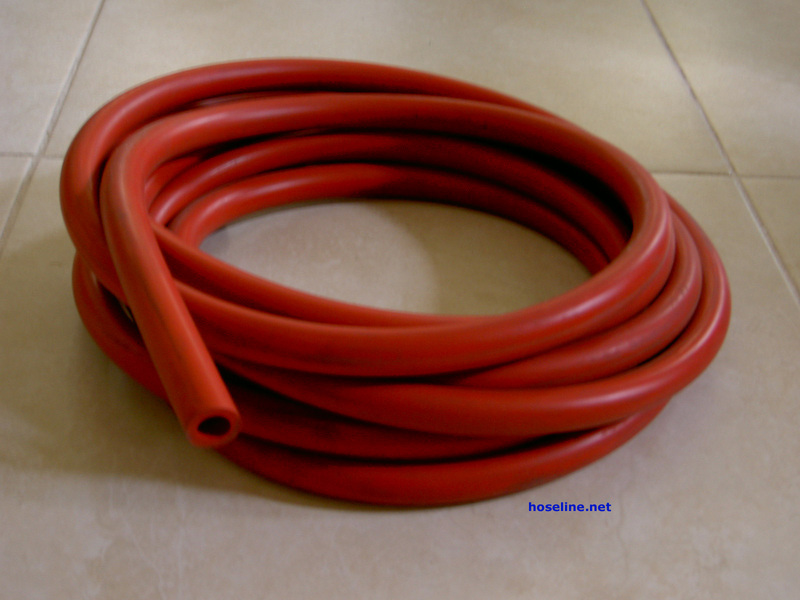 Ideal for automotive and industrial applications, such as, windshield wiper hose, factory machineries, electrical insulation, vacuum guage hose, coolant overflow hose, etc.. Do not use as fuel line plumbing. Minimum order: $200 per size. Updated: 2005. Silicone rubber hose construction with reinforced braid between walls. Very flexible, and resists high temperatures. Ideal for automotive and industrial applications that require glycol based coolant fluids. Exceeds SAE J20R3 requirements. Minimum order 25 feet. 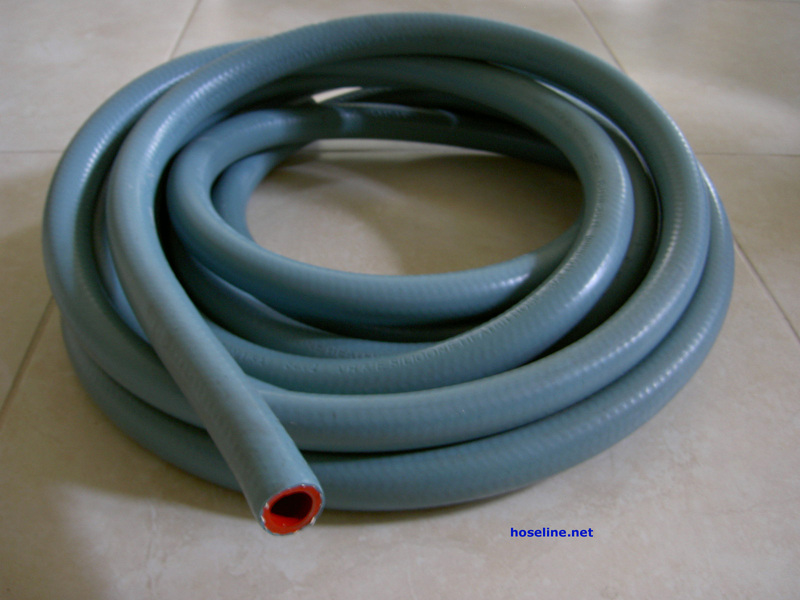 400 Series Coolant Hose. High temperature applications. Temperature range: -70 °F to 350 °F. Designed for cars, trucks/bus, home, and industrial use. Custom sizes are available. Updated: 2001. Aramid fiber material in brick red color, with three (3) stainless steel ristrictor rings for support. These are not stocked items.